We love a bedtime story and have read a story (or ten) at night since both children were born. It is now M's favourite part of the day and she often heads upstairs with an armful of books at bedtime. Some books excite M and some are rather more relaxing. 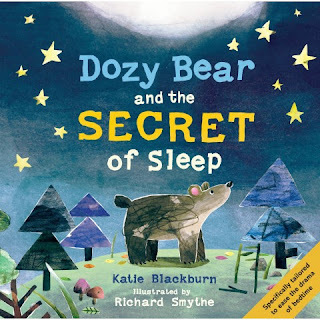 Dozy bear and the secret of sleep is one of the latter. We have been reading Dozy bear and the secret of sleep for a few weeks now and from the first time of reading the book I could see just how much the book relaxes M.
The book is "specifically engineered to ease the drama of bedtime" now I can't say we ever have any drama at bedtime but she is certainly far less hyper when we read this book at night. The book uses relaxation techniques to help a child (and parent) unwind at bedtime and I find the clever use of repetition and rhythm throughout the book does just this. I dare you to try and read this book WITHOUT yawning most of the way through it. The words are and story are very soothing to both reader and listener. The story follows bear who is tired but doesn't quite know how. He is so desperate to fall asleep and tries to find a way to drop off by himself. The illustrations throughout are perfect for the story and use just the perfect colours and details for a book of relaxation. Certainly worth a read to any child who struggles to nod off of a night.